What is The Brass Tap? The Brass Tap is an upscale beer bar that offers 60 different craft beers on tap, more than 300 varieties of imports, local craft beers, and a large selection of premium wines and cigars. We constantly are searching for the best beers from all regions around the world, and rotate our taps to ensure that you can always expect to find a new favorite. We offer hundreds of different bottled beers that are also available for carry out. 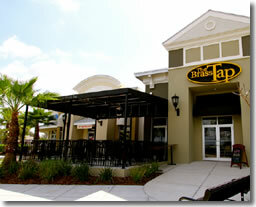 At The Brass Tap, you can enjoy our spacious patio and never have to drink the same beer twice! The Brass Tap is dedicated to treating people right and creating a unique experience every time. The relationship between our staff and our customers truly make The Brass Tap a local neighborhood hangout. Our team is passionate about beer and eager to provide you with the best beer to fit your taste. It is our customers who make us who we are and we are happy to give back to them. We love bringing people together and creating memories - good times with good people and great beer! Music - In addition to our beer, music and entertainment is a huge part of The Brass Tap experience. We strive to create a unique and friendly atmosphere every time and our daily entertainment is carefully selected to fit this niche. The Brass Tap vibe is upbeat, but casual all at the same time. Sports - Who doesn't love sports? You will not miss a minute of the action in any of your favorite games at The Brass Tap. 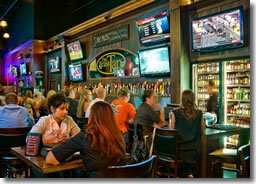 Our numerous high definition TV's have all the major sports packages ready to play on game day. Low Labor Costs - The Brass Tap does not have a kitchen, but does offer delivery from area restaurants so that patrons can enjoy a meal or snack with their beer. This results in a much simpler operation for The Brass Tap franchisee with a lower startup costs and lower recurring expenses, while still meeting the demand from guests for good food. In fact we are able to offer a much broader array of food options than other bars so that guests can get what they want from their favorite neighborhood restaurants. Because our operation does not have a kitchen which means less staff, less training, less management and fewer personnel hassles, the labor at The Brass Tap is essentially almost half of what is required for a typical quick service or full service restaurant which can translate into higher profits for you as the franchisee. Rapidly Expanding Market - Craft beers have exploded onto the scene during the last few years as beer geeks and beer novices alike have discovered the excitement and delight that goes along with the wide variety of beers available. In addition, a new generation of beer drinkers has been created as previous non-beer drinkers have been exposed to the wonderful world of craft beers. Double digit annual growth in the craft beer market has resulted and shows no signs of slowing down. Limited Competition - Today's consumers are looking for innovative alternatives to the traditional bars and clubs. The Brass Tap stands out from the alternatives when choosing where to go to enjoy a drink, with its casual yet energetic environment that provides a wide selection of craft beers as well as live entertainment. 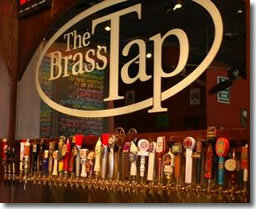 Click on Request Information button above for FREE information on how to start a The Brass Tap franchise today! Please Note: The Brass Tap opportunities for sale, and other franchise opportunities, business opportunities, businesses and franchises for sale on this web site are not to be considered as an "offering", "franchise offering", suggestion or recommendation by GlobalBX. The franchises, businesses and business brokers seen on this web site submit their own individual content. This advertisement depends entirely on the truthfulness of the information provided by our advertisers which includes, but is not limited to, franchisers, franchises, franchise brokers, franchise consultants, business sellers and business brokers. As always, GlobalBX recommends that you consult a lawyer, financial consultant, accountant or professional advisor before buying a franchise or business opportunity or any type of business. By submitting this form and requesting more information, you have agreed to all terms and policies of GlobalBX and the business and franchise offerings listed here. Please review our Terms & Conditions for more information.